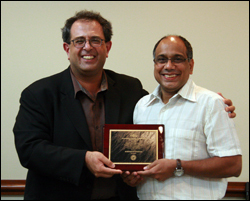 ISR Director Reza Ghodssi (L) congratulates Professor S. "Raghu" Raghavan on winning the 2012 Outstanding Faculty Award. ISR recognized the outstanding work of its faculty, staff, graduate and undergraduate students at its annual awards ceremony on Friday, Sept. 14. S. “Raghu” Raghavan (BGMT/ISR) is this year’s winner of the ISR Outstanding Faculty Award. He was nominated by Mike Ball. Raghu is a highly creative researcher who has contributed to a broad, highly current and very interesting set of problem domains. His work exhibits the best traditions of systems science and systems engineering. His background is in the network and combinatorial optimization areas of operations research. Raghu came to the University of Maryland with a distinct focus on telecommunications problems, and has continued to work in this area. His recent paper multi-period routing in satellite networks won the EURO 2010 Strategic Innovation Prize. This work demonstrated a very substantial potential benefit (in the hundreds of millions of dollars) for users of satellite services through the use of optimization-based methods for the routing problem analyzed. But in addition to his telecommunications work, Raghu has pursued work in two very interesting, and highly current topics: combinatorial auctions and social networks. In combinatorial auctions, working with his Ph.D. student Bob Day, he developed new methods for both the winner determination problem and the problem of determining a set fair payments that were slated to be used in auctions conducted the the Federal Aviation Administration, until the courts blocked the auctions! They were used in public goods auctions conducted in the U.K.
Raghu’s recent social network research is very promising. For this work he is collaborating with faculty in ECE and Computer Science to understand how information propagates in social networks and then to determine methods for influencing this propagation that can be used for marketing and other purposes. Raghu’s ability to define and solve interesting and innovative problems is most impressive. He has done this in all of his research areas. His work at its very core deals with systems issues, as it is all focused on the analysis of large-scale problems defined on networks or other complex systems. Dimitrios Spyropoulos is the winner of this year’s George Harhalakis Outstanding Systems Engineering Graduate Student Award. He was nominated by John Baras and Mark Austin. Dimitrios was an MSSE student who graduated this spring semester. John writes that Dimitrios’s research and results are central to modern systems engineering design methods and tools, and that his work encompasses substantive and fundamental systems science and engineering research as well as team work, collaboration and helping others. His accomplishments, contributions and maturity are outstanding for a person at his stage of professional development. Mark notes that Dimitrios’s talents are of the same caliber as the best Ph.D. students at Maryland. John ranks Dimitrios among the top five MSSE students he has encountered from the start of the program in 1987, and in the top five percent of all graduate students he has encountered at ISR. Dimitrios received an outstanding rating from General Motors, where he completed an internship in summer 2011. This internship is usually reserved only for Ph.D. students! Because of Dimitrios’s outstanding work, GM had us send another of our graduate students as an intern this summer. Dimitrios’s M.S. thesis research was extremely fundamental and will have a broad impact on Model-Based Systems Engineering methodology and tools. Mark notes that he has made progress in a problem area that is uncharted, technically challenging and central to the kinds of systems engineering research on which more people need to be working. It has been submitted to the prestigious 2012 IEEE/ACM International Conference on Computer Aided Design. As a volunteer TA in several of the systems engineering classes, Dimitrios has shared his knowledge about Systems Engineering methods and tools and taught other graduate and undergraduate students generously and unselfishly. David’s research focuses on methods and tools for energy-efficient buildings, using model-based systems engineering methodologies and tools. He was one of the research and engineering leaders in the university’s “Water Shed” solar decathlon house, which took first place in the 2011 international competition on the Washington Mall. David was part of the Spring 2011 ENES 489P Hands-On Systems Engineering Projects class, where he was the top student and led two student teams in projects related to the solar decathlon. His teams developed a model-based systems engineering approach to the design, including use cases, structure and behavior diagrams using SysML, and interfaced with MATLAB for behavior dynamic modeling and tradeoff analysis. David not only quickly grasped these concepts but also taught them to his fellow students. He has assisted with the course in each subsequent semester. David has joined the MSSE program, so we will be able to benefit from his presence for several more years to come. Rebecca Copeland is the recipient of this year’s Susan Frazier Outstanding Systems Engineering Staff Award. Becky was nominated for this award by Jeff Coriale and received support from S.K. Gupta, Steve Marcus, Cindy Moss, Jeff McKinney and her colleague Missy Corley in the dean’s office. She is a team player who supports ISR at many levels, and also works effectively with PR staff across the campus to make sure that ISR faculty and student contributions are well recognized. ISR faculty trust her, and she has an excellent understanding of what ISR faculty are doing. She is genial, has a positive attitude, and is always willing to pitch in wherever help is needed. She is a problem solver who will figure out the best and most creative way to reach the desired outcome. She has a great sense of what will make good news, and always shows thoughtfulness and a deep understanding of her audience. Becky has helped to organize many complicated events, such as the Robotics Days, various ISR anniversary celebrations, and the many Research Review Days of days gone by.